Next weekend we’ll enjoy a hosted stay at the Fairmont Pacific Rim hotel and indulge in dinner at their fine dining restaurant, Oru. Located in downtown Vancouver, BC, the Fairmont Pacific Rim will be another ‘staycation’ for us since we live and work in the city. (We recently experienced a staycation at a property owned by Fairmont’s sister company, Delta Hotels and Resorts — the Delta Burnaby Hotel & Grand Villa Casino, and enjoyed dinner and breakfast at their fine dining EBO Restaurant). As one of the newest and most luxurious hotels & private residences in all of British Columbia, we’re looking forward to basking in the lap up of luxury and experiencing everything this sophisticated and cosmopolitan property has to offer. This will be our first stay at the Fairmont Pacific Rim, but we previously reviewed the hotel’s Giovanne Cafe + Wine Bar for Eating in Vancouver, which became a featured press article on their website. We’ve included a few photos as a preview of what to expect from Fairmont Pacific Rim, but stay tuned for our complete review of the property, including all its amenities. We can only imagine it will be nothing less than exceptional as we’ve never met a Fairmont that we didn’t like! 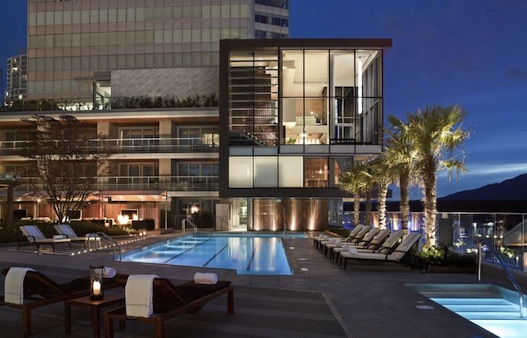 Have you stayed at the Fairmont Pacific Rim? What’s your favourite Fairmont hotel?